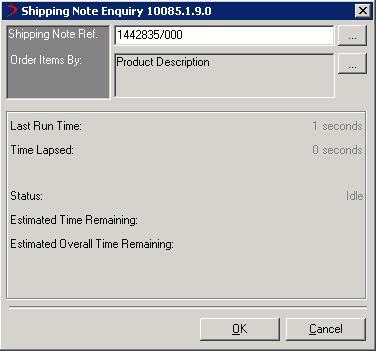 This report details where the shipping note was shipped from and to, when it was created and items within the specified shipping note. Any related goods received note references are detailed at the top along with the number of items received and when. The main section of the report lists the items contained within the shipping note, including shipped quantity and received to date quantities. Potentially items that were not on the original shipping note may appear if they were additionally booked in during booking in the shipping note. (Please note that the functionality to add additional items and change quantities when booking in a shipping note is configurable). You will need to enter the shipping note reference. Alternatively, use the shipping note search option by clicking the “...” button, where you can find and select the desired shipping note. 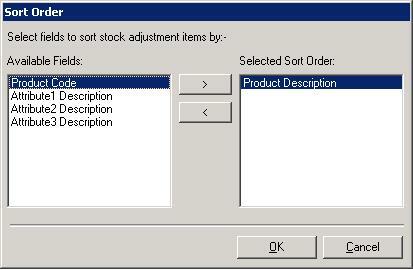 The order in which the items on the report appear can be customised by clicking the “...” button next to the order list and selecting the fields accordingly. See the image below which illustrates what fields can be ordered. To order the fields, add them onto the right hand pane in the order you desire and press ok. When the “OK” button is pressed, the status will change periodically to display what is being calculated and the estimated time it will take to complete. You may stop the report from loading at any point by pressing the “Stop” button. However, if you choose to re load the report it will re calculate the report from the beginning and not from the last previous point.